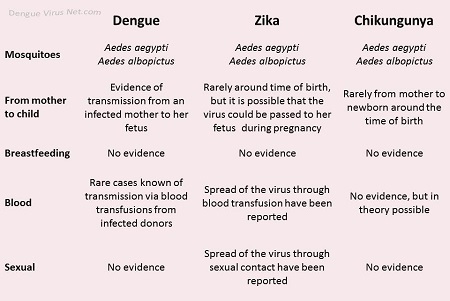 Dengue viruses are transmitted to humans through the bites of infective female Aedes mosquitoes. Most commonly, the mosquitoes involved are Aedes aegypti and Aedes albopictus, two species which can also transmit other mosquito-borne viruses, including zika and chikungunya. Other infection routes are reported from mother to child as well as blood transmission (see figure 1). The main transmission is through mosquitoes that generally acquire the virus while feeding on the blood of an infected person. After virus incubation for eight to ten days, an infected mosquito is capable, during probing and blood feeding, of transmitting the virus for the rest of its life. There is no way to tell if a mosquito is carrying the dengue virus. Infected female mosquitoes may also transmit the virus to their offspring by transovarial (via the eggs) transmission, but the role of this in sustaining transmission of the virus to humans has not yet been defined. Infected humans are the main carriers and multipliers of the virus, and serving as a source of the virus for uninfected mosquitoes. The virus circulates in the blood of infected humans for two to seven days, at approximately the same time that they have a fever (see also clinical symptoms). Aedes mosquitoes may acquire the virus when they feed on an individual during this period. In parts of South East Asia and Africa, the transmission cycle may also involve jungle primates that act as a reservoir for the virus (see figure 2). Figure 2. Transmission of dengue viruses. Dengue is most widely transmitted by the mosquito named Aedes aegypti (see video 1 and 2). The Aedes albopictus mosquito and other Aedes species also transmit disease in specific areas. Aedes polynesiensis, Aedes scutellaris and Aedes pseudoscutallaris in the Pacific Islands and New Guinea. Aedes polynesiensis in the Society Islands and Aedes niveus in the Philippines. The Aedes mosquito prefers to breed in water-filled receptacles, usually close to human habitation. They often rest in dark rooms (e.g. in bathrooms and under beds) and breed in small pools that collect in discarded human waste (see figure 3). Although they are most active during daylight hours, biting from dawn to dusk, mosquitoes will feed throughout the day indoors and during overcast weather. Dengue virus transmission follows two general patterns: epidemic dengue and hyperendemic dengue. Epidemic dengue transmission occurs when dengue virus is introduced into a region as an isolated event that involves a single viral strain. If the number of vectors and susceptible pediatric and adult hosts is sufficient, explosive transmission can occur, with an infection incidence of 25-50%. Mosquito-control efforts, changes in weather, and herd immunity contribute to the control of these epidemics. This is the current pattern of transmission in parts of Africa and South America, areas of Asia where the virus has re-emerged, and small island nations. Travelers to these areas are at increased risk of acquiring dengue during these periods of epidemic transmission. Hyperendemic dengue transmission is characterized by the continuous circulation of multiple viral serotypes in an area where a large pool of susceptible hosts and a competent vector (with or without seasonal variation) are constantly present. This is the predominant pattern of global transmission. In these populations, antibody prevalence increases with age and most adults are immune. Hyperendemic transmission appears to be a major risk for Dengue Haemorrhagic Fever (DHF). Travelers to these areas are more likely to be infected than are travelers to areas that experience only epidemic transmission.